The Goldilocks and the Wild Bears slot is the fun fairy-tale themed game from Quickspin. Some of you may know as I posted it on my YouTube channel, I had my first online slot machine jackpot from a Quickspin slot; Second Strike. I’ve been a fan of Quickspin slots ever since. 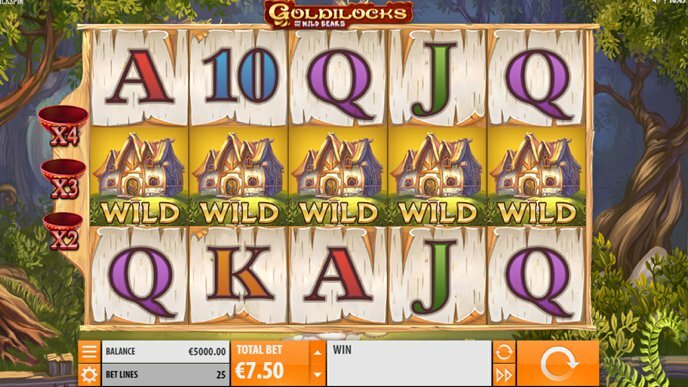 The Goldilocks and the Wild Bears slot is a very well designed, highly detailed game with 25 win-lines and stakes from 0.25 up to 100.00 in either UK pounds or Euros. There’s one main bonus feature, as well as several wild symbols during the base and free spins bonus. The winning symbols are made up of the regular 10, J, Q, K and A, plus four bears. That’s right, there are four bears in the Goldilocks and the Wild Bears slot. Three of the bears are ‘real’ and the other one is a toy. The game-play on the Goldilocks and the Wild Bears slot is very smooth, with most winlines making sense. Although as there are 25 ways to win as opposed to the more common 20, some of the winlines are rather obscure. The highest value symbol is Daddy Bear who pays x10 for a regular win, however these values can be multiplied by the porridge wilds which are active during both the base game and the bonus round. These wilds can make Daddy Bear worth up to 40 times your stake! Porridge Wilds: There are three porridge bowls on the centre three reels, each acts as a wild. If one symbol adds to a win, it multiplies the win by x2, two porridge bowls multiply by x3, and four porridge wilds multiply by x4. Regular Wilds: The Goldilocks and the Wild Bears slot not only has multiplying wilds, it also has regular wild symbols scattered on all five reels. These can work in combination with any symbols, including the porridge but not the bonus, they are however also active during the bonus game. The base game on the Goldilocks and the Wild Bears slot has the potential to be very generous, and it often keeps you steady whilst you wait for the best part of the slot to come into play; free spins. The free spins bonus on the Goldilocks and the Wild Bears slot can be hard to hit as it uses only three symbols available only on the centre three reels. However, I’ve had it a couple of times and it pays very well; check out this video of my big Goldilocks and the Wild Bears free spins bonus which I published on YouTube. Land three Goldilocks symbols in view on the centre three reels to be awarded an initial 10 free spins. As the reels spin, wins will be accumulated in the usual way, however what you are ideally aiming for are the Goldilocks progress scatter symbols. Each symbol progresses you up a ladder to turn more bear symbols wild. The first ladder needs three Goldilocks scatters, you will then turn Daddy Bear wild plus be awarded an additional 2 free spins. The next ladder requires a further five scatter symbols to turn Mother Bear wild, plus a further 2 free spins, and the final ladder again requires five more scatter symbols to turn Baby Bear wild with 2 more free spins. If you manage to turn all of the bears wild with a few spins remaining, your winnings could be huge as the bears, wilds and porridge wilds all combine to create massive wins. The Goldilocks and the Wild Bears slot is very good, and even though it can be costly to trigger the bonus, more often than not it will be a big win. This is very similar to Rainbow Riches Free Spins, with the expensive but high paying bonus. Goldilocks and the Wild Bears is available to play at Casumo, you may also try it for free using the link at the top of the page.